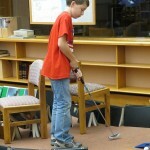 Mini golf? using books? in a library? at The ​Prairie School​? It happened! 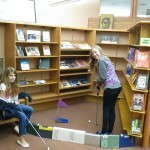 On Friday, October 17 middle and upper school students spent a few hours after school playing a few rounds of miniature golf in the Student Resource Center (SRC). 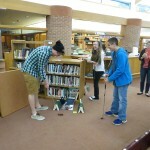 The books, tables and chairs were arranged into an 18 hole miniature golf course allowing over​ 25 students to compete against each other ​Friday evening​. Eighth grader Sam Christenson came out as the evening’s victor with 34 strokes followed closely by Steve Savas fellow classmate who accumulated 36 strokes. “The idea came to a me a few weeks back,” shared, McKenzie Weaver, Director of the SRC. 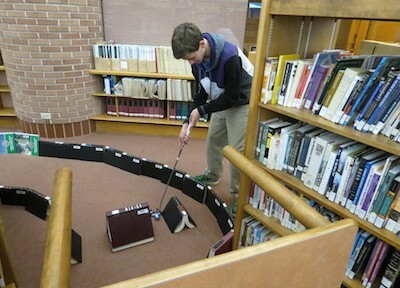 Middle and upper school students helped Mrs. Weaver design and set up the course and run the event. Later this week, middle and upper school students will also participate in a second event to support National Teen Read Week. 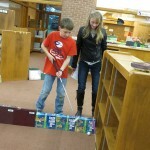 Students will create artwork using old books and library materials. 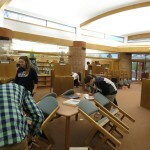 The artwork will be displayed in the SRC and will then be taken home by students. This entry was posted in All News, All School, Featured, Learn More About Prairie, Middle School, Upper School by Communications Department. Bookmark the permalink.